This time last year I felt like I was in the dream of "X-Plane, A Christmas Carol" The Charles Dickens story of your humble simulator. There was first the "X-Plane of Christmas Past" or in layman's terms X-Plane10. The X-Plane10 version was now almost complete after its journey of four years, this was a breakthrough version of X-Plane that finally brought the visuals up to the standard of quality flying that was in a complete contrast to the basics of X-Plane9, better weather, better autogen, better avionics had created a simulation that was really good, realistic and throughout X-Plane10's odyssey the payware add-ons of aircraft and scenery had also become the higher power of quality that we now all take for granted. "X-Plane of Christmas Present" was last years hybrid of newly released X-Plane11's beta, new, clean and very different from X-Plane10. We though really didn't know the true depth of what we really had yet in the new version? was it good, brilliant or just a nice upgrade as the then jury was still out on all of that. But at the same time as X-Plane11 was released and so was xEnviro, an expensive but very interesting new environment engine, but again it was in its really early development stage. Another fact of "Christmas Present" was WorldTraffic. Another add-on of considerable complexity but hopelessly lost in its own brilliance and the work was already ongoing for the next version in the "user friendly" version of WorldTraffic3. But here was the promise of "X-Plane of Christmas Present". X-Plane11 was running, xEnviro also looked really good and you could at certain airports run WT2 and get a sort of an wide broad idea of what all three together would look like in a vision of "X-Plane of Christmas Future"... In twelve months time what of a real sort of simulation would we then have, it was exciting but also sort of disconcerting at the same time. Obviously three sort of betas or not so full versions were going to be not very reliable or gel together in the sort of fusion that you required for a good simulation, but the future was there, it worked (sort of) and it all looked very promising. So here we all are now in that promised "X-Plane Christmas Future"... the future is here and did it all work, did the dream happen as wished and more importantly are we happy with the results? As with any changes and certainly with a significant step like this, it was certainly an interesting mix, but the overall result was that all those three areas in X-Plane11, xEnviro and WorldTraffic3 are all now fully compatible and running together as one pure simulation. And so did they all deliver on the advancement of X-Plane as a whole as a simulator. The answer is an astounding yes, in fact the future as it stands now is that if you run the full system together it does feel like you have stepped right over a full version of X-Plane to X-Plane12, that is the sort of monumental step that X-Plane simulator took in 2017, a significant year? Yes certainly and the vision more than fulfilled the promise. It is however not a complete score card for everyone as we shall see, and that significant jump also came with a small cost as well in hardware. So let us go through these significant areas to see how it all came together as our "X-Plane of Christmas Future" and the addition of more one extra element that made the active side of the simulator come alive as well, and remember VR (Virtual Reality) is just around the corner as well. I will put out the debate in that was X-Plane11 really ready for release even in this beta form. Was the simulator released to meet a target date (Thanksgiving 2016) and not a development date? My personal go on that question is that really the software wasn't ready for release as it was about two months short. Don't get me wrong because the Laminar Team pulled lots of rabbits out of hats to get it a more viable running simulator and quickly as the simulator wasn't half bad by mid-January. Myself I didn't even run the X-Plane11 version seriously until early January except for that earlier look and test, but as for using the simulator then that wasn't actually possible and for many reasons, the main one is that I am now always very wary of new software straight out of the box, I learnt that in the very hard way. So now I am a follower and not a frontliner, but it has saved me a lot of pain and frustration. And in reality and certainly with X-Plane11's case it was the right approach to take. It also allows you to make a better informed analysis of the software than the disjointed one of what was in reality a very incomplete or unrefined release from the start. A secondary reason was that in reality there was no actual aircraft to fly with X-Plane11 anyway. By three weeks in and we are at beta 8, and that was finally the update beta release to see the new simulator version in its much better cohesive form. I also did a huge clean out between XP10 and the rehoming of the all the elements (Scenery, plugins and aircraft) to the newer XP11. A lot, in fact a huge amount of debris was either filed away or binned, it was like a new home and a far better place to be in at that. X-Plane11 was certainly the far different place to be in. Leaner, cleaner but more importantly by far it was a more efficient in the fact that the interface was all new and that made navigation a far better idea, go back now to XP10 to see how hard it really all was, and how long it really took everything to load. It was and still is a huge step forward. Laminar also took away our toys... settings were far more generic and a lot of them were now set for the best framerate and efficiency, you could still fiddle with them through a back door, but I quickly realised that the settings provided were the best you could use and any backdoor fiddling was more to the negative than the positive, and one area that also came back was the visibility mist like you had in X-Plane9. Many hated the mist and still do, but I warmed to it's incredible realism and spending more than a few hours over the year comparing my real life aircraft window images to the simulator's version, then the conclusion is that the mist is as real as it gets. That was the basic first impressions, but the sheer power of X-Plane11's features then started to be revealed in a more slower longer process and not the directly into your face over the year, it is a deep simulation is X-Plane11 and far deeper than it looked on the surface when you first flew in the new simulation world. The biggest barrier to early X-Plane11's use was aircraft. Laminar had done a lot of basic fundamental changes to performance and developers needed to get their heads around the significant differences, then to make it more difficult as Laminar in their wisdom did a complete revise of the aircraft performance and months after the release in March, so developers were basically back to square one. Laminar will note "well it is still a beta" but in reality it was a bit unfair and Laminar should have had at least this area covered before the initial release. This performance issue split developers into two camps... the first group did a semi X-Plane11 release that covered the XP11's new features and performance, but it at least gave you the aircraft to fly in the XP11 simulator. The second group just sat it out (for months) and waited till XP11 went final before tackling the changes and both camps were in reality right in their approach. But the wait and see approach did cause those developers to get a lot of "when will you update to XP11" calls. They also didn't want to update either because if you wanted one of their shiny new upgraded aircraft to fly in X-Plane11 then you were going to have to pay an upgrade fee or repurchase the aircraft. This was a contentious issue and in some areas unfair to a few that had only just purchased their addons and now they had to repurchase them again with the same aircraft or scenery to just fly in X-Plane11. Personally I think this could have been handled better and fairer, and was a big barrier to many users switching over to XP11 and most stayed then only flying on in XP10 as they still do because of that significant upgrade cost factor. But the other side of the coin was that developers now have to deliver upgrades for the full duration of XP11's run and for free, that is four years of non-payment until the next version upgrade, and so it goes both ways and the features that X-Pane11 brings to the upgraded addons are also significant. The sad thing is that these non-switcher users are still not seeing or using the immense benefits of XP11's features and this was brought home to me very early in the year. One of the most appreciable benefits were again the visual aspects of PBR or "Physically-Based Rendering". This feature created excellent light reflections and unbelievable texture reflections that brought the realism of real to life, add in the new "metalness" feature and sitting in an XP11's cockpit was now a revelation of almost touch like existence, VR (Virtual Reality) will highlight the feature more to the "amazing" level of reality we now have available in simulation. I spent most of the early months of 2017 with my jaw on the floor and my eyes wide as one after other of aircraft and sceneries spellbounded me with their extreme realism and that revelation has not left me even at the end of the year. In my point of view PBR was the best feature that XP11 produced and the images in our reviews are certainly a huge step more realistic and real than the same images in XP10 to highlight the differences. Other X-Plane11 features were slower to emerge over the year. FMOD sound is a huge step forward for X-Plane as the sounds in reality except for 3rd party addons were quite basic. But it has taken time for developers to get their heads around it, but once they did, then the feature quickly became the normal... but it took time or the second half of the year to get there. The GNS G1000 GPS system was also in a longer period of gestation and was only released in v11.10 and very late in the year, but the wait was well worth it. Other areas that were XP11 features like autogen and aircraft I will cover in those areas later, but again although small in comparison it all added up to significant changes to the simulator as a whole. Overall X-Plane11 introduction was more a slow burn than a wham in face hit, but on a deeper level a lot of ground was covered and so was the bugs and refining of the new version. Laminar Research have changed a lot in their approach to releasing and updating the simulator over the last few years, but this more methodical approach is covering more areas and turning out a far more professional product and even if I may say it, it is a far more mature simulator. In X-Plane11 the weather did get a welcome refinement and thankfully a better framerate hit and is now good from average. But 3rd Party tools will and can do a better job on focusing solely on one area than the extremely wide range of areas that Laminar has to cover. There are far to many shader changers that adjusts the XP default weather, when in reality it is the basics that need the treatment. Skymaxx was a great release in finally a 3rd party addon that had a go at doing X-Plane weather in realistic way. But xEnviro was a revolution in the way it totally and completely created a different and realistic environment in X-Plane, use it and then turn it off to understand the total game changer it is. I know I have harped on about xEnviro all year, but my points are significant in what it delivers, yes it is extremely expensive, yes it is not perfect and full of artifacts, but in the right areas it delivers in creating a mood or a scene that is beyond perfect for simulation flying. Anyone who does purchase it then kicks themselves in "why didn't I do this earlier and stopped instantly complaining about it". As noted the product is good, but the service was dismal throughout the year. To succeed in any business then the product has to be good but so then does the support as well. In a note the support has lifted its game towards the end of the year, but in other areas it still leaves a lot to ponder. The worrying thing about all this is that fixes via a few updates throughout the year was all that was required as any good developer does. The first update was nine months after the initial release in September and finally fixed that bad crash to desk top issue, and in reality the differences between v1.6 and v1.7 were minuscule. Worse was the main areas where not addressed. Clouds still have bad lines in them, horizon lines and circles under aircraft... biggest misdemeanour is the fact that after after twelve months there is no Mac version? But "hey" they are bringing you wet runways in the next version, but still anyone who adores Steve Jobs can't run xEnviro? It is crazy stuff you can't make up... priorities!. And worse the Maccers are not even on the current list yet, but way down at the bottom.... it is so crazy it makes you cry. The reason I hate this point is the fact that they can't use one of the very best addons in X-Plane, the Maccers are missing out on something really great... complain now to your local xEnviro thread. Oh how difficult was WorldTraffic2... It was for diehards only. The idea was great, but translating the idea to the simulator was hard. The only way to fix the plugin was to gut it and change the foundational aspects that made it all work. In other words it was a big job, but a necessary one. I was a beta tester on WT3 and it wasn't pretty earlier on but finally the basic principles were right, and ease of use was finally in reach of everyone's fingertips. I was excited about WT3 all year but couldn't tell a soul, if you look carefully at most reviews this year it is running in the background, the clues were there if you had looked hard enough. At it's release back in September, WT3 was not still a fully rounded plugin, the basics are done, but now it was the turn of the community to give WT3 its legs. As the changes are based on the upgraded functionality of X-Planes ATC ground routes for that ease of use. It also is highly reliable on those ground routes being perfect to get the very best return out WT3. If there is no ATC ground routes or poorly created ones then WT3 would function badly as well. The older WT2 ground routes did still work, but not in every aspect if you wanted to edit certain gates or features, again WT3 totally relied on those ATC ground routes being perfect. It will take a few years for WT3 to be totally and fully immersed with X-Plane11 as this area is filtered out, but some brilliant work by Chopinet and K-man has shown how to do it well, as fully completed routes are simply a marvel to behold. If the ATC routes are well done like at the sensational Aeropsoft - EDDF, Frankfurt by again another good XP designer in Omar Masoor then you can see the huge difference that WT3 has brought to the X-Plane simulator this year. The promise was always there, but now WT3 certainly delivers on that promise in spades, as WT3 is not just a choice but an essential aid for the simulator. So there we have the three cornerstones to the current X-Plane step to immortality. But one more interesting addon was added and created another new fundamental corner to this years serious advanced change... XPRealistic. Movement in simulators is nothing new. We already had "shake" or Headshake by Simcoders that gave you basic movement, and a few addon aircraft had those landing shakers to make the landings more realistic. But the difference with XPR(ealistic) was that you could set the movements and actions for different types of aircraft which in the real world move or fly in vastly different ways, a GA is very different in movement to A380, and so this plugin reflected that and you could save that aircraft's profile to use or change aspects of that in the future. The only downside was that the plugin used the "FlywithLua" (FWL) plugin as a host, nothing wrong with FWL as a plugin, but it does sometimes conflict with other plugins on several levels as I painfully found out. But here was another very different dynamic to compliment the other changes above, and all four together is an X-Plane experience you could have only dreamed of a few years ago. The vision of "X-Plane Christmas Future" came to pass, but it was far, far better and superior than the vision of "X-Plane Christmas Present". Of course you don't get these huge changes and and visual overload without a penalty. Most users complained that the changes to X-Plane11 required a major updating of their hardware, which was in effect completely wrong. X-Plane11 could easily run and in fact is far more efficient and faster than X-Plane10 was. There was no huge step required in hardware like there was between X-Plane9 and X-Plane10 to cover for those extended texture tiles and OSM data. Certainly X-Plane11 had grown significantly from the start of X-Plane10 run. But the main penalty was in the usual area of graphic processing and created mostly by those huge 4K textures that had a more bigger footprint by the way that PBR rendered the textures. Aircraft and their systems are far more deeper and complex compared to most of the earlier XP10 aircraft and the weather as usual did its job in overloading the graphic engines. So the requirements jumps easily from a minimum of 1gb to 2gb then quickly went to 4gb in basic rendering power. But then this year a minimum of 4gb is now required and mostly another step to either 8gb or 11gb is going to be the normal. Thankfully Graphic card costs are relevant, but these have become the basic requirements to run the X-Plane11 simulator in its current form. And so all the above is highly conspicuous of the changes over the 2017 X-Plane year, so it is to your own impressions if these aspects do create that significant and even extreme aspects that the X-Plane simulator in its current form, is now vastly superior than it was in the past. With the release of X-Plane11, then Laminar included new aircraft to the line up (and took a few older ones away). The main new aircraft included was the Boeing 737-800, the Mcdonnell Douglas MD-80 and the Sikorski S-76. A Cessna Citation was promised but it has even to date not been released. All the remaining aircraft got updates, but most were average. The Boeing 747-400 was unflyable for most of the year and still needs a little more attention, but some aircraft had loads of attention lavished on them with especially the King Air C90B and the Cessna 172SP. The Cessna 172SP was also upgraded to use the G1000 GPS system in the release of X-Planev11-10, so overall it was a mixed bag. The native Boeing 737-800 became one of the most interesting aspects of the year. Someone fed up with the basic aircraft decided to upgrade it significantly and so was born the words of the year in "ZIBO Mod". The ZIbo modifications were and are quite extensive with other users also throwing in their modifications in FMOD sounds 5.1 by AudioBird XP, the TerrainOnND by DrGluck and many others. This also spawned another project on the same native aircraft called the "Boeing 737 Ultimate" that will add in a full cabin, opening doors and various winglets or scimitars and that is due for release any time soon. I doubt any aircraft in any period of X-Plane has offered as much discussion and excitement as these projects on the Zibo Mod ideas. The results was and is a payware grade freeware aircraft, but to note it is experimental (which puts it certainly deep into the X-Plane coda of design) but it is actually very good. I came to it about the middle of year and it was interesting but with still a few rough edges (mostly with the very detailed FMC) but it does raise a lot of questions in that will more aircraft like the Boeing 747-400 or the DC-80 also get the Zibo Mod treatment, or if Laminar is smart enough to bring the projects in house and make them official... we shall see, but the result was one of the most interesting aircraft of the year. A large percentages of releases in 2017 in aircraft were all mostly upgrades to the X-Plane11 version. A lot as noted were released as "new' versions, but in reality they were mostly the older XP10 versions with a lot of new features and the alignment with the X-Plane11 performance changes. So 2017 was notably "The year of the Upgrade". Some aircraft had a lot of revisions, some even close to monthly in releases which made sometimes a lot of confusion on what version or what even the release aircraft version actually was. First out of the box with XP11 conversions was the Challenger 300 and CRJ-200, both are flyable at years end, but need attention. Most notable in that category was Rotate's MD88 and JARdesigns A320/A330. X-Crafts and SSG did a huge amount of changes to their E-Jets and often tack to tacked each other on features or updates, both are great but overall the SSG had more of the edge with their latest releases in the excellent E170/E195LR by the end of the year. The Boeing 777 and A350XWB were both upgraded by FlightFactor but only to "keep them flying" grade. In fact in new releases FlightFactor was very quiet with only the Boeing 757 having a significant upgrade to the "Pro Extended" version with three variants of a -200, -300 and a Cargo. Like a lot of the significant X-Plane developers most were only visible for the X-Plane11 upgrades and most decided only to concentrate on new X-Plane aircraft or a totally revising of their older designs, so expect a lot if not a huge explosion of classic X-Plane developer releases in 2018. Including FlightFactor with a A320 Ultimate, FlyJSim with all his products in the B727,B737 and Q400 having extensive upgrades, QPAC under a new name called ToLiSSs with a A319, Ddenn with his Global 6000, Harrier VV8b by Trident and the biggie with the McDonnell Douglas MD11 by Rotate. My main guess is that the developers wanted to have a more of a completed and stable X-Plane11 before releasing anymore "banner" aircraft and then having not to update and change monthly or even in some cases this year weekly. The Boeing 787-9 that was originally developed by Heinz Dziurowitz has had a lot of updated development by Maglight, but is still not a really dedicated study level simulation of the aircraft. That is one of the biggest holes in the X-Plane simulator currently, and yes there are a few scores of developers doing their 787 designs, we will see on how that one turns out in 2018. The oddest to really strange development in 2017 easily went to the McDonnell Douglas MD-82 by ATS. The aircraft came out early but right at the intersect between the change from X-Plane10 to still in late beta X-Plane11. It fell really through the cracks as it didn't fit in either camp. Plus it was odd in the fact that it didn't or you couldn't use the even basic of X-Plane commands to fly the aircraft, so you had to every time you wanted to fly the aircraft reset your basic keyboard and inputs to get the right commands in datarefs, and then switch them all back again to fly everything else? It was still highly buggy as well, and as the year went on it slid away into obscurity. The thing is, when you did sort everything out and sort of got some control over the aircraft it was quite nice to fly and was a good simulation, but its strange abnormalities easily outweighed its benefits? As usual the General Aviation arena of X-Plane delivered a lot of gems in 2017, in fact even some so brilliant that they are best aircraft for X-Plane in a while. Aerobask was brilliant with their excellent Pipistral Panthera, Eclipse 550NG and Velocity V-Twin. All these aircraft had excellent new GPS systems with the Dynon SkyView and GTN750/GTN650 instrument systems, but the overwhelming factor was their use of X-Plane11's PBR tools that brought in a new high benchmark in textures and interior quality, breathtaking was the word. Another huge quality delivery was from vFlyteAir with their excellent PA-30 Twin Comanche that was simply an incredible aircraft with outstanding menu features. Their Sirrus SR20 G1000 was very good as well and there is no doubt now a serious player in the GA stakes of high quality aircraft in X-Plane. There was a few new serious GA players as well with PicusX and their Aqulia A210 & A211G, and AeroSphere Simulations with their Cherokee Warrior ll, Arrow IV and Archer lll and Piper Seminole a developer to watch in 2018. Another few developers came on board as well with Auctusdelineations and his very interesting EV-55 Outback and Avia71 for his skilled aerobatic machines. One of the biggest new developers to come into our orbit was VSkyLabs. The developer runs a site dedicated to creating various interesting aircraft as projects, and the are all very good, even if a few are of the obscure design school. His Tecnam P2006T was a great utility machine, but it was his rendition of the Classic DC-3/C47 that has brought him fame and fortune in X-Plane. The initial release was basically sound and good, but with poor textures and no exterior rivet work, it was brilliantly great and average in one package. But the development process was furious and the DC-3 grew quickly into the classic aircraft it is that X-Plane has dreamed of for years. Before your eyes it became something else and no aircraft this year has given me more exhilaration and a smile on my face than this exceptional machine. It is of course nowhere near perfect, but it is excellent to fly and must be used with the XPRealistic plugin to get the most alive flying experience in X-Plane today. One of 2017's must have aircraft. Carenado had their usual busy year, but releases were restricted mostly to getting there huge 35+ aircraft up to X-Plane11 standard, it is a lot of work... and those upgrades will continue well into 2018 to cover all the range. The highlight from Carenado was the absolutely incredible Dornier Do 228 that hints of more greatness in the future. It showed that the combination of a great FS quality developer and a brilliant X-Plane designer can produce something that not only pushes the quality and features to another level, but deliver a flying experience that is second to none. The Arrow lll is not perfect as the menus are average and the price sets a new higher barrier for a GA in X-Plane, but all in the right places it is quite simply an extraordinary aircraft. X-Plane scenery had an extraordinary year in 2017 in X-Plane as well. The introduction of X-Plane11 brought with it some excellent new features that would transform scenery at an fundamental level, mostly in PBR and certainly with the metalness textures in glass and reflections. X-Plane11 also brought in better basic WED rules with far better ACT routes (important) and great native ground traffic. There was the impact of Laminar's "Global Airports" or WED airports that delivered hundreds if not now thousands of quality 3d scenery, they do range from the basic to excellent, but now it is that WED as a scenery tool is extremely powerful, but it has certainly delivered to fill in a weak area of X-plane's simulations visual aspects. But another aspect was the regional areas finally also getting attention. German (or European) autogen made a huge, massive impact in any European or even anywhere away from the usual South-Cal feel of X-Plane autogen. Laminar added in some landmarks to Las Vegas and London as well, but overall the new euro autogen changed the whole landscape for flying around the continent. We expected some 3rd parties to bring in some dedicated regional packages (the system is in place for them?) but nothing happened and neither did say the same autogen idea for the UK or Italy. So it all ended the year in quite an odd way. Something that can fundamentally make a huge difference visually to your X-Plane experience has sort of been left to ponder, we hope (no pray) that 2018 will change that scenario. The year for scenery in 2017 started off with a huge bang as CYBD - Bella Coola BC by Beti-X which was a masterpiece of intimate scenery, the game seemed over before 2017 got even started. But this was an exceptional year on all levels for great scenery and finally scenery started to develop to a quality point to point flying in that the quality was there when you departed, but the same quality greeted you when you landed, in other words you got the full total gate to gate experience. Aerosoft had a banner year in X-Plane. The main change was the use (finally) of a decent X-Plane scenery developer to do their upgrade work, and boy did that show. Omar Mansoor (KRSW - South Florida/KDFW-Dallas Fort Worth) did the bulk of the work and the results were simply sensational. MisterX went pro in 2017 under the name of ShortFinal Design. The past master of freeware scenery like KBOS, KLAX, KSFO and a long list of free great airports delivered even more greatness and another level of quality with two sceneries in KSLC (Salt Lake City) and the remarkable KABQ - Albuquerque International Sunport, he may have gone over to the darkside, but you couldn't simply fault his work or live without it. Ninbus Simulation Studios (Butnaru) had a busy year as well with three sceneries coming out of the studio. With KMCO - Orlando, the excellently featured TFFJ - Saint Barthélemy Airport and an recent update to KATL - Atlanta. Drzewiecki Design delivered the excellent Washington XP but by their standards it was a quiet year. Other highlights included a great update to KLAX v2 by FunnerFlight and a new and talented developer in KHAF - Half Moon Bay by Rising Dawn Studios. And the if very interesting YAYE - Ayres Rock - Connellan Airport by RIM&Co that didn't know when to much is simply too much of everything, but the Rock itself was excellent. Overall it was not just one thing that brought scenery to a extremely higher level in every area in 2017 for X-Plane. It was the fusion of many parts that combined to give you an exceptional canvas in which to fly. The X-Plane11 features of autogen, ground traffic and better WED tools then combined with better features and the sheer higher quality of the scenery. Certainly the aspects of WorldTraffic on scenery had another huge milestone impact, in this area then X-Plane had a that banner year of fusion. As the payware sceneries deliveries this year was so highly strong, I didn't use (or download) as much freeware as I did in the past. The person I totally admired in the past was tdg, and his exceptional work. But I couldn't and neither could a few other serious scenery developers try to understand why he refuses and still does to not insert WED ATC ground routes into his sceneries, yes it is as they say a "bone of contention" but a huge swath of (300 hundred) sceneries of his great if brilliant work and now unusable scenery is now either (in my case) not being used or even downloaded, why is totally beyond belief, but true. unfortunately as WorldTaffic3, X-Life builds as does the native A.I., then his work will diminish in non-use, I hope tdg sees the light in 2018 before it is too late. For third party plugins they had in 2017 to be more than just become a special feature you could access. In the past they now had a very direct and active influence on to your actual screen but more significantly and in the way you used X-Plane, in a few cases the plugins have now become a vital component of the X-Plane system itself, and in 2017 it was the plugins that were the major highlights of the year. I have above already noted above the huge impact the major plugins with xEnviro, XPRealistic and WorldTraffic3 have already made to X-Plane this year so there is no need to repeat the facts again here. Only two items to note... Flightfactor delivered their AVS or Airport Visual System, that the review didn't make the post before Christmas because there was only so much time and it is big review. Another plugin point is that developers are starting to use plugins as a means of delivering their products not related to plugins themselves but other aspects of the simulator and for later product updates. One or two is fine, but I hope they don't start to clog up our plugin folders with these product designed tools and even keeping a watch on your use of your simulation uses, this current friendly backdoor helper could quickly get too invasive for their own agendas even if the developer is currently only saying it is not the case. I am sure we will talk about this more in 2018. And so we come to the closure of another X-Plane year in 2017. And every year it is usually noted as a "milestone" this and "best year ever' that, but what of X-Plane in 2017. Even the diehards would have to admit it was a significant year for the simulator, and a maturing year. With so many elements coming together and in a surprisingly more efficient simulator than we ever expected then certainly this was a defining year in so many ways. We did see and now have the "X-Plane of Christmas Future", and how good is that. The X-Plane community also welcomed in 2017 an unprecedented number of new users to the simulator and many are enjoying X-Plane for the first time. Numbers don't lie, the proof that X-Plane is still growing and is still moving forward is one of the greatest Christmas gifts you can have, more people are enjoying what you enjoy and the significantly more users are also contributing to the simulation only means they are giving up their valuable time to contribute and that does mean that X-Plane as a community is a gift that keeps on giving all year round. Without them, then the software is nothing, X-Plane is not only a great piece of software, but more importantly X-Plane is in the end of the only about the people that contribute and use that software. Again this Review site cannot function without all the great and exciting work by the tireless developers that give us all this exciting product to fly and use, as I mentioned earlier X-Plane has come a long way in the last few years. To the X-Plane.OrgStore who supports this site with service and updates, a really big thanks. 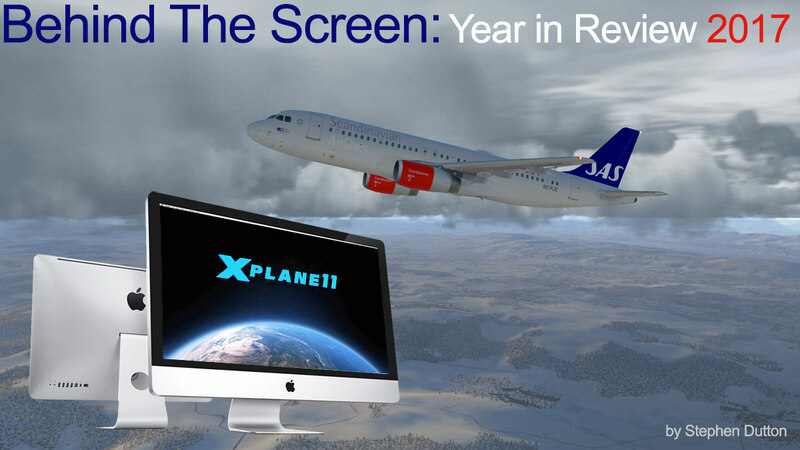 Of course X-PlaneReviews wouldn’t exist either without you the users and your contribution to both the simulator and to reading this site and your comments, so thanks and tune in again in 2017 for even more in-depth analysis, great detail, inside and future product news as X-PlaneReviews heads into its 5th landmark year. Yes they win again, but it was a really excellent upgrade. If it had been formally released it would have won easily, overall a poor year for top end airliner releases. A great aerobatic aircraft to have fun in. Shouldn't totally love but do : That DC-3! Takes GA flying to a completely higher level again, including the price! A lot of upgrades but nothing new, next year should be better. Again a huge amount of choice of great releases. Delivered the impossible and has completely changed the look of X-Plane airports at the same time with WorldTraffic3, oh and WT3 is actually easy to use. Delivered what they promised and more, VR is coming soon as well. The Impossible made possible, now your airports are active and really alive. Shakes you, moves you and brings your aircraft alive from the inside, a plugin developer to watch. Best Moment of the year 2017 : Watching the dream finally all work... WorldTraffic3 in all its glory at 3am in the morning at EDDF. Biggest distraction of 2017 : Finding no ATC ground routes at an airport I really wanted to use for WT3, and yes it was usually a tdg airport! Personal Favorites of 2017 : Rotate MD-88 (awesome), vSkyLabs DC-3 (way too much time flying this aircraft to nowhere), Carenado Beechcraft 1900D (just so good), PA28R Piper Arrow lll by JustFlight/Thranda (so good, so challenging), A320 JARDesign (point to point), Native X-Plane11 B737-800 its basic but great to fly. That is X-PlaneReviews for 2017, and we will be back after a very much needed break and rest early into the New Year on the 3rd January 2017. I don't know if your "Best of the year award" is dedicated to payware only: if it's open to the freeware, there is the absolute gem DC-3/C-47 from Aeroworx. I own the VSkyLab too and they provide both a slightly different view of the same airframe; really interesting to compare them. And they are some nice dedicated painters as well. I agree with you about Beti-X Bella Coola (and Stewart!). The only downside, if there is any, could be the time to deliver products but, even, I still prefer a low pace in high quality than a quickly done product. As always, thanks for your reviews. Have a great New Year too Stephen, all the best. Yes we regard payware should be better than freeware, although that is not always the case, but the quality of payware today in X-Plane is outstanding. I checked out the Aeroworx DC3/C47, but very early in its development, and it wasn't as good, I know it has improved so will check it out again. Best of the Year is to the "person" that had the biggest overall influence on the simulator, all those noted and no doubt worthy are all niche players, as noted Christophe, you haven't used WT3, I think you should and you will see the impact it makes on your simulations, The area is just too complex to be in the background use, and I totally agree that good plugins should be seen and not heard, but WT3 is as in the background as it is going to get as it needs info to work and that has been Greg's genius in that he has made the plugin highly usable and easy to use once it is set up, and if tdg had played ball with the rest of us he could have been part of the ideal instead of now being outcast on the sidelines. Thanks and a great New Year 2018 to you. Great summary of the year as usual and I agree with most of what you say . The default clouds now give me better looks and better FPS than SkyMaxx Pro for the first time so it's now been parked in my "unused plugins" folder - together with WT3 (which is a bit crashy on my rig).